Today I'm delighted to welcome Alison Morton to my blog and to launch the blog tour of her new novel RETALIO which comes out next week (see below for a GIVEAWAY of a signed copy). I first met Alison when she joined our little group of historical writers putting together 1066 Turned Upside Down. It was an alternative history project in the sense that we were writing the events of 1066 as if they'd happened another way but Alison is a master at alternative history as her entire Roma Nova world exists in an alternate reality - and it's a fascinating and highly entertaining one too. Her award-winning Roma Nova thrillers are set in an alternative timeline where a remnant of the Roman Empire survived into the modern age. In her world four hundred members of senatorial pagan families left Rome in AD 395 and settled in mountains to the north. Grit, adherence to Roman values and silver in their new mountainous home helped them survive. As there were so few of them to defend their new homeland, the young women had to fight alongside their fathers and brothers. The older women managed the families, worked the fields and traded to keep their colonia alive. Roma Nova became egalitarian out of necessity. You can read the whole story here. The first three stories – INCEPTIO, PERFIDITAS and SUCCESSIO – are set in the present plus a few years and feature Carina Mitela, a Praetorian officer who battles killers, betrayal and a particularly nasty nemesis. The second trilogy – AURELIA, INSURRECTIO and RETALIO (out 27 April) – feature Carina’s grandmother as a young woman. When writing the first trilogy, Alison became intrigued by the older Aurelia and knew she had to go back in time to write her story! The modern society these women and men live in is intrinsically Roman: they speak Latin, they adhere to the pagan gods, they have a strong military and robust attitudes. Alison wanted to write Roman-set stories with women leading the action, not being adjuncts of the male protagonists. This meant bringing them into the 20th and 21st centuries and hence alternative history. You can read more about alternative history here but in the meantime, let's hear a little more about Alison herself. Why were you drawn to the Romans? I confess to being a ‘Roman nut’ since the age of eleven when I was fascinated by my first mosaic in Spain. In the interim, I’ve clambered over most of the ruins of Roman Europe and read Roman fiction (starting with Sutcliff’s The Eagle of the Ninth) and non-fiction ad nauseam. Rome lasted 1229 years; just to give a bit of context, this would take us back to AD 788 from today. Over that time, Rome went from being a tribal village to conquering the known world, introducing complex systems of government, production and trade, heights of art, engineering, and organisation, along with prosperity, corruption and debauchery. And it all ended in a rump, kneeling in the dust to barbarians. It’s breathtaking! Ha! I’ve written all my life one way or another since I scribbled my first play at age seven. (I was obviously the princess.) More seriously, I’ve been a career translator, linguist and editor, a civil servant who had to write policy papers, a local magazine editor, copy editor and blogger, as well as student slaving away over academic theses and dissertations. So I’ve fiddled with words for a long time. The trigger for novel writing was a bad film: the photography was accomplished, but to this voracious reader the plot continuity was dreadful and the dialogue corny. I whispered to my husband, “I could do better than this!” Of course, he replied, “Well, why don’t you?”. Ninety days later, I had 90,000 words typed. Of course it was rubbish as all newbie first drafts are, but there was a kernel there that grew into the Roma Nova series. When readers send you nice emails! More precisely, when your vision, your writing and your characters appeal to others to the extent that they can see your world and even want to live there. You know you’ve made an emotional connection to their imagination; they ‘get’ your book. The backache! Writing is fun, energising and fulfilling, but it’s also a slog of getting X words written each day. It takes a lot of physical effort to type 100,000 words. Sometimes the story and the characters’ interactions and dialogue run faster than I can get the words down! The other distraction, although I enjoy it, is the promotional side of writing life. I ran a business before I started producing novels so much of the territory is familiar. But I wish there were 36 hours in each day. This may be cheating… The six Roma Nova books are set in the late 20th and early 21st century. I rather fancy going back to the end of the fourth century and writing the foundation story. Rome was disintegrating in Late Antiquity and Christianity and the rise of new dynamic tribes in Europe were pushing it along that path. The pagan Romans were persecuted for their persistence in holding to the old gods. Emperor Theodosius made it a capital offence to even drop a pinch of incense on a pagan altar. Rome was in crisis. What an interesting time to write! Alison's sixth book, RETALIO, will be published next week on 27 April and is available here. Plus I'm delighted to offer readers a GIVEAWAY of a signed, print copy of Retalio. Just post a comment below to enter the draw which will be made on publication day, next Thursday. You can buy all Alison's books here and read more about her books and the world they create on her Roma Nova site. 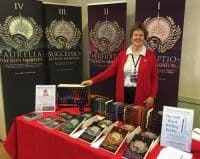 Why not comnect with her on facebook, twitter or goodreads or sign up here for her newsletter and to get a free copy of INCEPTIO. The foundation story of Roma Nova would be great, Alison, if you do write about that in the future! Thinking about it, Chris, thinking about it! Afraid you missed out in the draw this time Chris, but thank you for posting and I hope you continue to enjoy Alison’s books. Please comment here to enter the GIVEAWAY. Oh, I have also read one of Alison Morton’s other novels, _Aurelia_, and loved it! Would be thrilled to read more from her! After Aurelia comes INSURRECTIO, then the endgame – RETALIO! Afraid you missed out in the draw this time Lisl, but thank you for posting and I hope you continue to enjoy Alison’s books.